Wrap Up: Clean Looks and Feature Packed. What's Not to Love? Setting out to improve on the H230 and H630, NZXT recently updated its silent chassis range with a new mid-tower that touts a redesigned interior, next-gen FN V2 fans and better aesthetics. Some great ideas have gone into the H440, notably the decision to drop old-fashioned 5.25" drive bays to use the space for other hardware, a move we're interested in seeing others make. Typically, cases designed with the goal of being silent have been bland looking. The Antec P100 is a fine example of a model that dampens noise, yet is boring to look at and uninspiring to work with. The H440 tackles this in several ways while still keeping a clean look. Along with a window to jazz things up, the H440 comes in your choice of white, red, orange, blue or green accents. Regardless of which color you pick, you'll pay $120 for the H440. That's double the $60 an H230 would set you back and it's not far off the asking price of NZXT's H630 ultra tower. Still, as a no compromise mid-tower, we are not shocked by the H440's price considering $120 buys you either the Fractal Design Define R4 or Cooler Master HAF XM, while $130 lands the Antec Sonata III 500. If you are willing to go to $150, the Corsair Obsidian 650D or Silverstone Temjin TJ04 are options, while mid-towers such as the Rosewill Legacy MX2-B Trio can cost as much as $200. 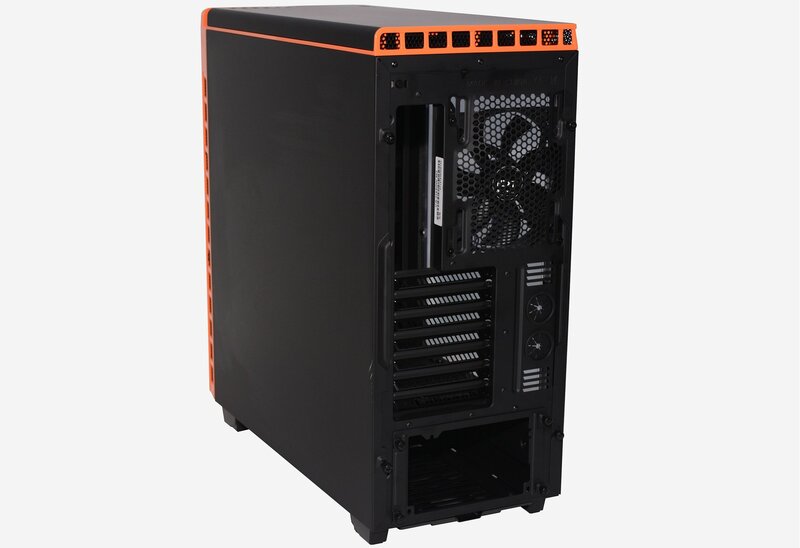 The H440 mid-tower has been constructed from steel and plastic, it measures 220mm wide, 510mm tall and 476mm long, and it weighs 9.8kg -- not bad considering it's a steel chassis. From the front, there isn't much to talk about when discussing the H440. 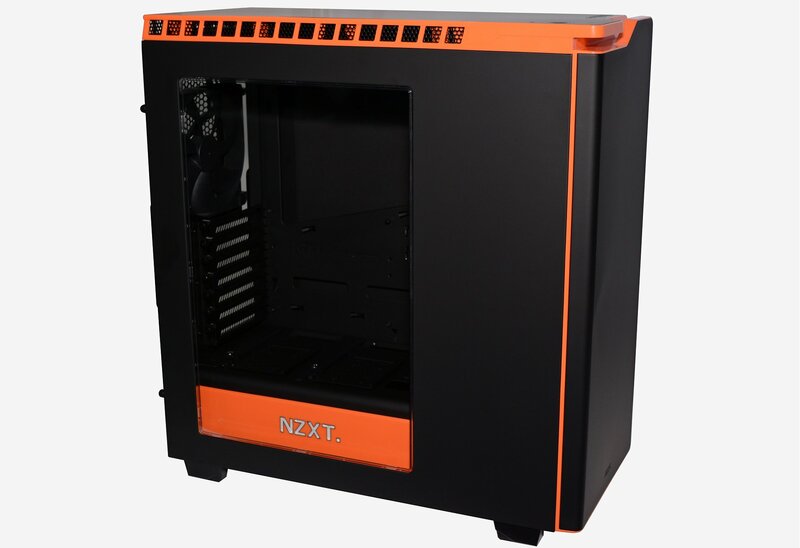 Since NZXT has removed all 5.25" bays they have been able to create a clean unbroken façade. It takes 'clean' to the next level. 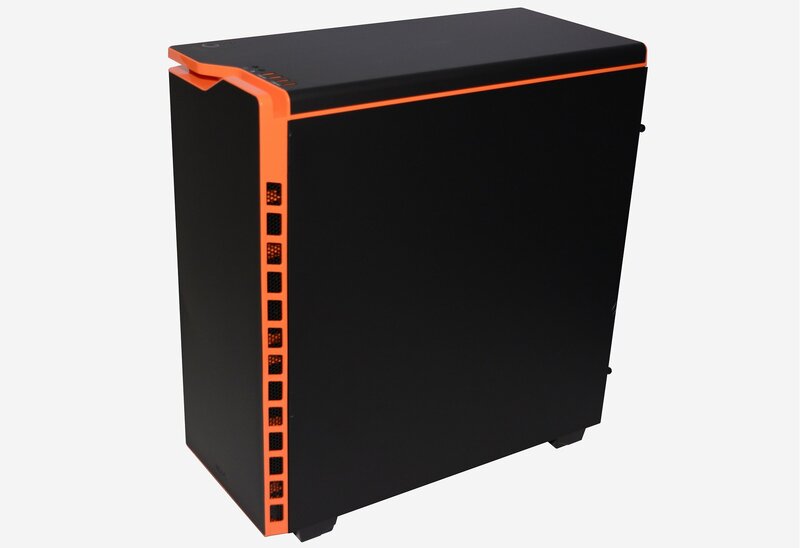 The front cover has a colored border, in our case orange, while the top left cover features a small cut out that can be used like a handle for removing the panel to clean the dust filter covering the in-take fans. Interestingly, the structure of the panel has been made from plastic while a thin sheet of black SECC Steel has been inserted into the surface of the plastic panel to give it a durable look and feel. With the front panel removed, it becomes apparent that this plastic and steel combination is very heavy. 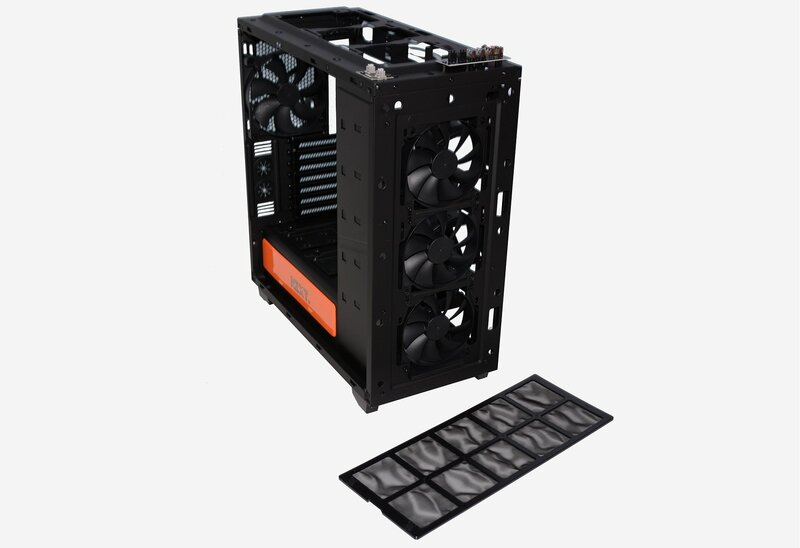 On the inside of the panel is a thick hi-density foam and rubber mat that is designed to absorb sound generated by the three in-take fans before it can escape the case. Air is pulled in through the right side of the panel through a long, skinny black mesh. Behind the door on the case is a large magnetic dust filter which can be removed and re-fitted in just seconds. It's a nice touch. At this point, you may have noticed we are yet to talk about the I/O panel and that's because it isn't on the front of the H440. 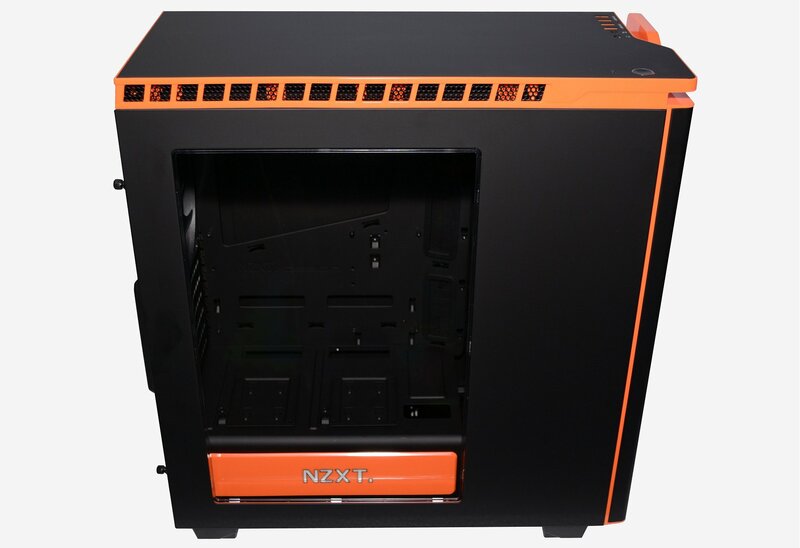 Instead, NZXT has moved it to the top of the case where it can be used easier if the case is sitting on the ground. Apart from easier access, another advantage of this location is it keeps the front panel clean and removes the need for an I/O panel door. 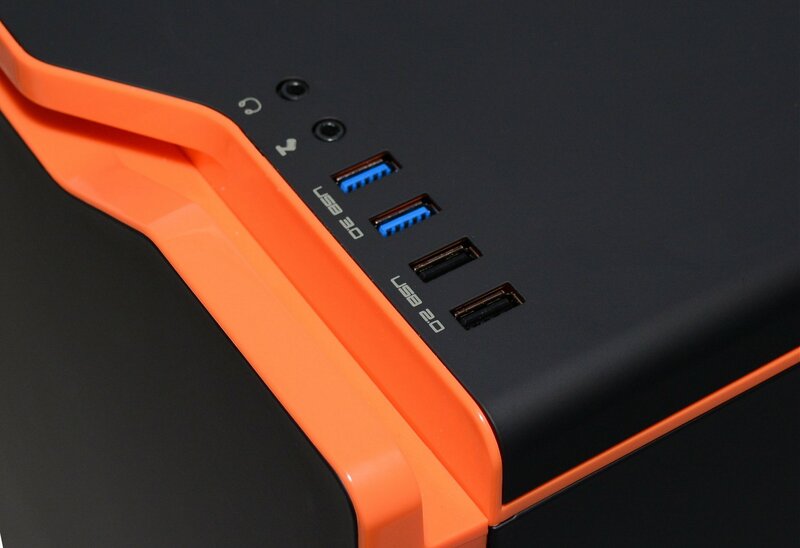 The I/O panel features a pair of USB 2.0 ports as well as two USB 3.0 ports and two audio jacks, which are situated beside power and reset buttons. Apart from the I/O panel the rest of the top looks much like the front and in fact it is. An almost identical plastic panel is used, though this time the ventilation is on the left side. The same rubber mat is used on the inside to deaden sound and the same black steel insert has been used on the outside. 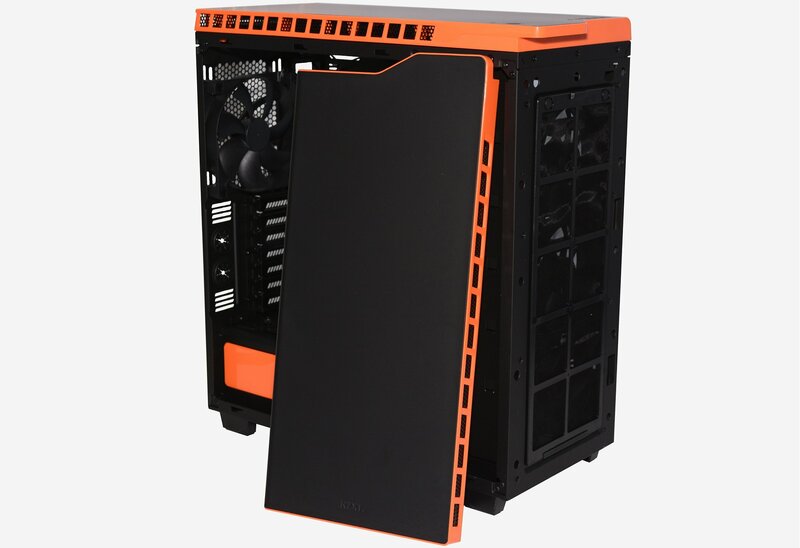 A large Perspex case window in the left door panel gives the H440 a bit of flare, showing off the motherboard area while hiding the hard drives and all the cabling that goes along with them. The opposite side has the same panel minus the window. Around back, users will find a removable PSU bracket that is secured with four thumbscrews. Above that are seven expansion slots and a pair of inch-wide water-cooling access points. 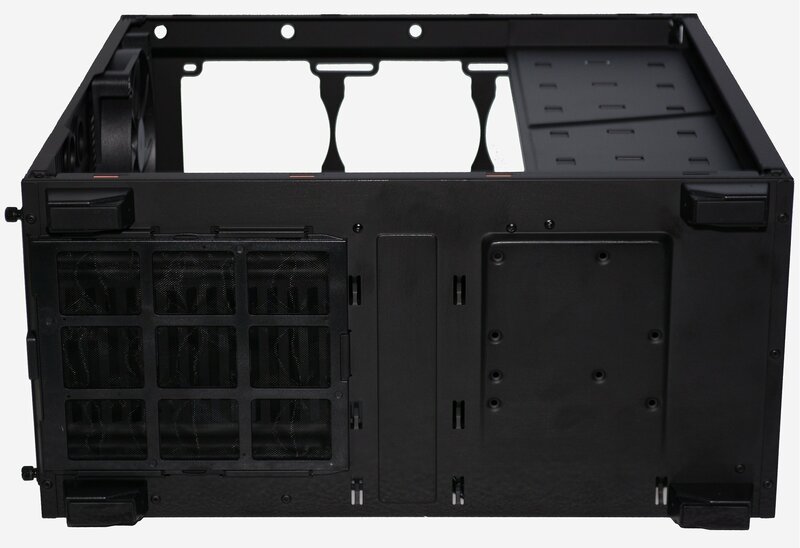 At the top, we have the motherboard's I/O panel along with a large fan grill that supports 120mm as well as 140mm fans. Finally, underneath you will find a third dust filter designed block debris from entering the power supply. 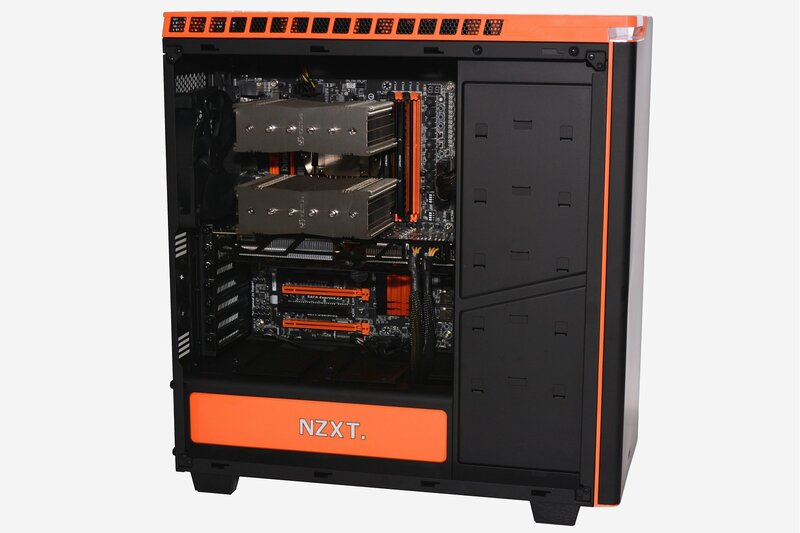 There are also four feet with rubber protectors that stand the H440 about 2cm off the ground. This clearance is essential if the power supply is orientated in a way that requires it to draw in air from under the case.